​Do you feel that you are being tracked online? ​Spyware is probably spying your activities and stealing private data. ​By avoiding any future spyware attacks, your privacy on internet is protected. Detects spying program hiding in computer and removes them completely. Stops malicious activity and frees up processing power of computer. Spyware is actually a tracking software used to monitor activities on computer. Employers might use keystroke logger or Parents might use it to keep an eye on their kids. However, when such tracking software is abused, it can be a threat to privacy. Cyber criminals use it to spy on web browsing habits, log keystrokes to steal password, record activity using web-camera or microphone. 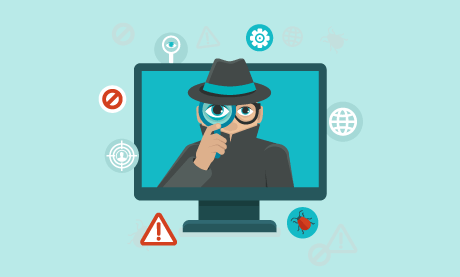 Password Stealers, Banking Trojans, Infostealers and Keyloggers are some types of Spyware. Learn more. Where does ​Spyware come From? The term Spyware came into being back in 1999 when it was bundled with a freeware game. Spyware are difficult to detect because there is no visible activity as such. First indication of spyware infection could be noticeable reduction in processor or network connection speed. You must check out Task Manager for any unknown process running in the background. Firewall can also give you a hint about any malicious program making outgoing connection from your computer. Learn more about ​difference between Spyware and Malware. It is possible to remove spyware manually if you’ve found the culprit process in the above explained places. Otherwise, spyware programs are in stealth mode and difficult to get rid of. Many Antivirus programs come with anti-spyware module, but they may not be as effective as you want to be. You should run full scan of computer using Spyware removal tool by MalwareFox which detects hidden spyware and removes it from roots. How to Protect from ​Spyware? Freeware from unknown sources should be avoided at any cost (pun intended). Firewall log should be maintained and monitored on regular basis. Suspicious processes and outgoing network connections should be suspended immediately. Most importantly, you must install reliable anti-spyware software like MalwareFox which makes sure that you are protected realtime from any kind of spyware attacks. Why MalwareFox ​Spyware Removal Tool? ​Real-time protection from future cyber-attacks..
​Aggressive detection capabilities to find hidden spyware​.